FOOTBALL: Arsene Wenger's future at Arsenal is still shrouded in doubt after the club missed out on qualifying for the Champions League for the first time in 20 years. The Gunners defeated Everton on the final day of the English Premier League season 3-1 but wins for Manchester City - 5-0 at Watford and Liverpool - 3-0 at home to Middlesbrough meant Arsenal finished in fifth spot, with the top four qualifying for Europe's elite club tournament. Latest media reports say that Wenger will sign a new contract whatever the result in Saturday's FA Cup final against Chelsea at Wembley Stadium. But the Frenchman said fans' continued protests about his stewardship at the club had played a part in the failure to reach the Champions League. "We were playing in a hostile environment," the Frenchman said. "The players came back stronger in the last two months and I'm very proud of them for doing that. "One thing you cannot question is my love for this club. I've turned down every club in the world to stay here." City finished third with Liverpool fourth, while Spurs finished their season in style with a 7-1 win at relegated Hull. Harry Kane scored his second hat-trick of the week to confirm the Golden Boot award, while Dele Alli also hit two in the romp. 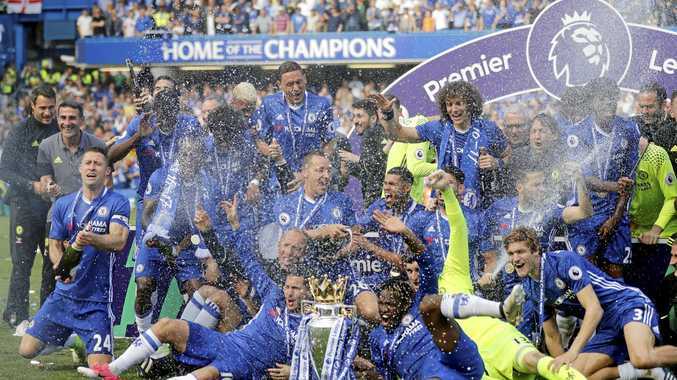 There was also a party atmosphere at Stamford Bridge, where Chelsea fans celebrated winning the title and the last game of stalwart John Terry. Chelsea's 93 points was the second highest total since the EPL began in 1992 and Blues became the first EPL team to register 30 victories in one season. Antonio Conte's side was presented with the trophy after beating bottom club Sunderland 5-1, where club captain John Terry made an emotional farewell speech to the crowd. "Today is one of the most difficult days of my life," he said. Sixth-placed Manchester United beat Crystal Palace 2-0 after resting several players ahead of Wednesday's Europa League final against Ajax Amsterdam in Stockholm. In other results, champion Leicester City missed out on finishing in the top half of the table, placing 12th after a 1-1 home draw with Bournemouth. Swansea City came from behind to defeat West Brom 2-1 at the Liberty Stadium to move up to 15th, while West Ham won by the same score at Burnley. Stoke City had a 1-0 win at Southampton.